Condo sales in the City of Toronto are down by 14.4% while prices are down by 8.4% ($32,549) in mid-February from a year ago, says TREB. Past Sunday Mark Carney made it official that the housing correction (crash) is underway and is going to last a few more years while he is on a five year vacation in England. 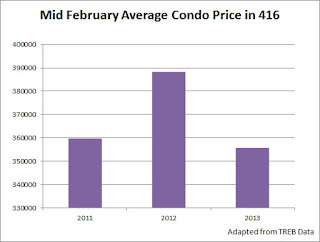 So if this is just the beginning of the correction, I wonder how much more Toronto condo prices will drop? 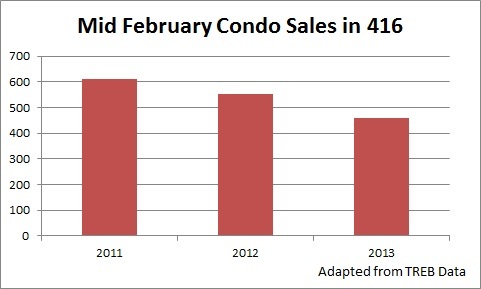 In the 905 condo sales were down by 11.6% and prices rose by 2.3%. In the City of Toronto detached house sales went down by 4% while prices rose by 5.8%. 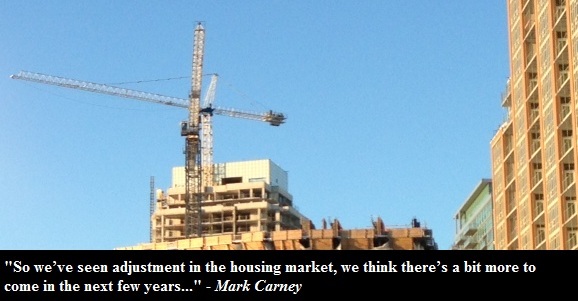 In my view, this is not surprising as I expect city condos to fall first in price as they are the weakest link. The Toronto housing bubble is essentially Toronto Condo Bubble. As the condo bubble bursts, people who thought of selling their condos and buying houses in 416 or 905 will have less money to spend, and this eventually will result in lower prices for all types of houses. This is also known as ripple effect. While many other types of dwellings in the GTA are over valued on their own, I think the trigger to their declines will come from the burst of Toronto condo bubble. In other news, the "Condo King" - Brad. J. Lamb is to conduct a free condo investment workshop aimed at young Canadians.